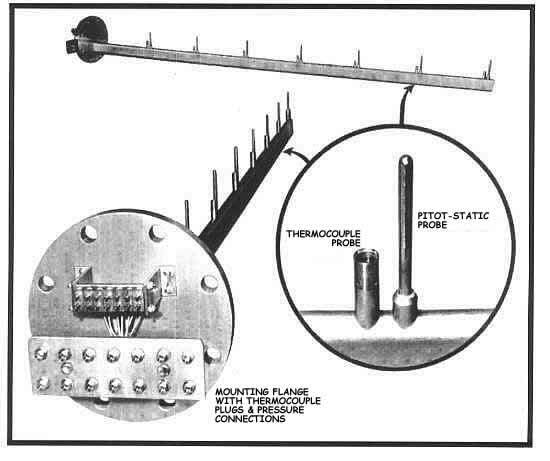 Pressure and Temperature Rakes by United Sensor Corp.
United Sensor Pressure and/or Temperature Rakes measure a cross-section of total pressure, static pressure and/or total temperature of a moving fluid. Rakes offer the advantage of providing many separate readings simultaneously or a simple average of many readings. Every United Sensor Rake is custom designed and constructed to match the flow conditions of its particular application. Overall Rake length may vary from fractions of an inch to twenty feet or more, incorporating two to several dozen individual measuring elements. The design of a given Rake is determined by many factors, including fluid velocity and temperature, flow angle variation, the type of measurement required and the physical dimensions of the flow passage. materials are stainless steel or inconel, unless otherwise specified. Any United Sesnor Fluid Flow or Temperature Probe may be incorporated into a Rake; however, specially designed elements are more convenient and lower in cost. To determine which Rake design is best suited to a particular application, download our Rake Specification Check List.